Even though five-year-old Kamila is used to getting blood drawn, she cried out when the needle pricked her arm, clinging to her mother for comfort in a classroom-turned-clinic in the northern Colombian city of Riohacha. Venezuelan Kamila was born prematurely at 30 weeks, weighing just 900 grams (2 lbs). Her early entry into the world came with kidney problems and cerebral atrophy that have delayed some parts of her development and kept her limbs spindly. She is one of the thousands set to receive treatment this week from doctors and dentists from United States Navy hospital ship the USNS Comfort. Many are Venezuelan migrants who have fled economic crisis across the border. Others are Colombians, including indigenous Wayuu, seeking care amid constant delays in Colombia’s overcrowded health system. The United Nations on Monday pledged $9.2 million in aid for Venezuela, where hunger and preventable disease are soaring due to food and medicine shortages. President Nicolas Maduro blames the country’s problems on U.S. sanctions and an “economic war” led by political adversaries. 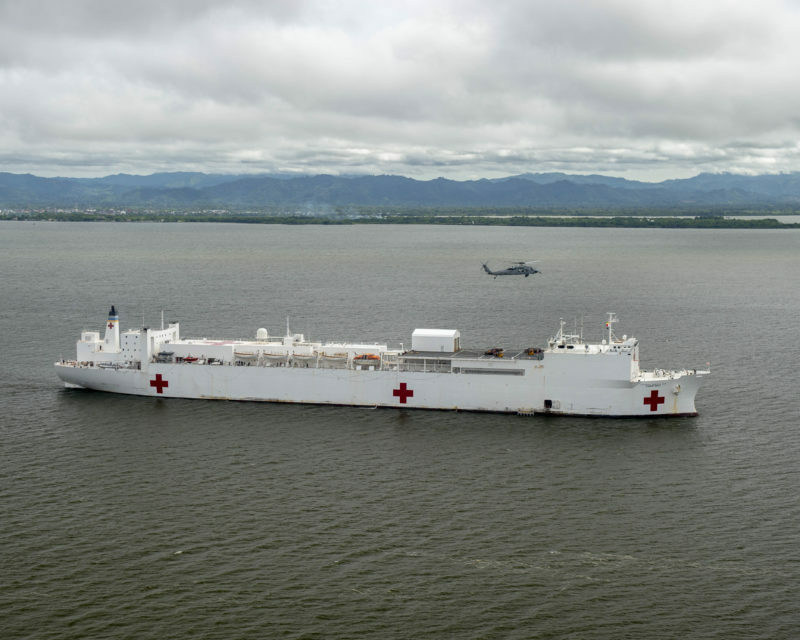 Most patients, pre-screened by local authorities, will receive care on land in two clinics set up in schools, while those needing surgery will be flown by helicopter to the USNS Comfort itself, anchored far offshore. “The tests we needed for her would have cost so much in Venezuela, but here they did it in a few seconds,” said Kamila’s mother Yennymar Vilchez, 24, who arrived four months ago. The USNS Comfort staff last week treated more than 5,400 patients over five days in Turbo, a city near the jungle border with Panama, including 131 who had surgery. An estimated 2,500 will be seen in Riohacha, 91 kilometers (56 miles) from the border with Venezuela, through Friday. The arrival of Venezuelans has burdened the beleaguered Colombian healthcare system, especially in border cities, where patients can wait months for basic care. Colombia, which has received about one million Venezuelan migrants, could be hosting four million by 2021, the government has said. Many cross the countries’ porous land border without documentation, heading onward to other Latin American countries like Ecuador and Peru. Outside the dentistry room, Yessica Epiayu, 29 and a member of the Wayuu indigenous community, corralled her six children, aged 3 to 11, as they took turns getting cleanings. Her eldest son Orlando grinned broadly, proudly showing off a gifted dental mirror. Some surgeries require too much follow-up to be performed on the ship and are referred back to local authorities. Venezuelan Belkis Chirino, 29, a former restaurant manager, had hoped her 11-month-old daughter Jade could get pelvic surgery to guarantee she will walk despite a congenital deformity. But the doctors need further X-rays and the intense procedure, which risks damaging some nerves, will require significant time in the hospital. But others like Vilchez, Kamila’s mom, got good news. Her daughter’s kidneys are getting healthier and a new medication will help her other symptoms.